I made this little velvet dress a while back now. I found the mushroom pink velvet cotton at Rathdowne Remnants and thought it would be perfect in one of my little deers pinafores. Velvet is hard to find and the colour is really sweet and unusual. This dress is for sale in my madeit shop in sizes 0-5. It features a sweet appliqued deer, covered buttons and a lined bodice. It's super soft and nice and warm. All my clothes are made to order but I obviously have made one of each item which are for the girls and family. I think Isabella will christen this little pinafore today on our brunch date with friends! These are so sweet Suz, that is such a neat design. They should sell like hotcakes! What a gorgeous little dress! I love the little deer on it! It's lovely to see velvet becoming available again..I love it for little girls and I love the colour you've chosen too! I love that mushroom pink colour, and the fact that it is velvet cotton! Great smile in that last photo! You're right it is a lovely colour velvet...I love the little deer signature as well. Found you via the Our creative space linky. That's a lovely little dress! I remember having a velvet dress when I was little and loving the texture. 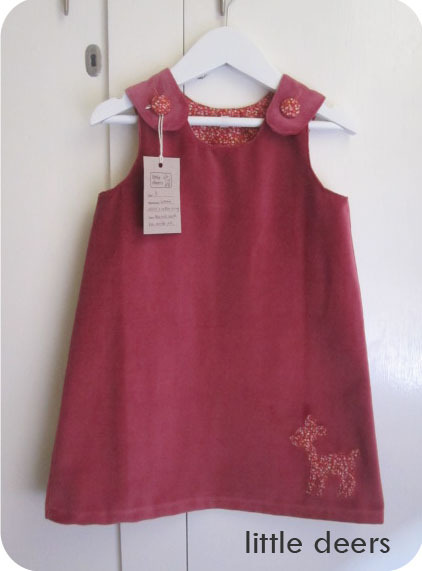 I think that a little deers dress is just the thing for my niece on her 2nd birthday next month! Just gorgeous Suz! The little deer looks fantastic. It is a very controversial therapy, with studies showing that in the short term HRT may banish the depleting side effects of menopause but as reports show, HRT may let loose greater health risks such as thrombosis and uterine cancer later in life.